It was an eventful nightcap, as the Sea Dogs used a five-run ninth to down New Britain 8-3. Matt Spring, who hit a two-run homer in the second, led off the ninth with a solo home run, his eighth of the year in only 129 at-bats. Ryan Dent immediately followed with a homer to give the Sea Dogs a 5-3 lead. It was the second straight day that Dent went deep, after homering just once in his first 43 games. After that, the floodgates opened. Derrik Gibson doubled, stole second base, reached third on an error, and came home to score on a Cecchini double. Michael Almanzar drove in Cecchini, then scored himself on a Ronald Bermudez base hit for the fifth run of the inning. Starter Jeremy Kehrt was solid, giving up three runs on only three hits, while striking out five without walking a batter. Pete Ruiz picked up the win in relief, retiring all six batters he faced in the eighth and ninth innings and striking out a pair. Henry Owens pitched the bulk of a combined no-hitter last week for Salem. On Monday he did the improbable, again pitching five no-hit innings in Salem's 5-2 win over the Potomac Nationals (WAS). Owens struck out nine of the 18 batters he faced, while walking three and has now pitched 15 2/3 consecutive no-hit innings stretching back to July 11. The bullpen was unable to preserve the no-hitter this time, but they were able to save Owens' eighth win of the year. Madison Younginer made his first appearance since being activated from the disabled list, allowing a run on one hit in two innings, striking out one and walking two. Nate Striz pitched a scoreless eighth. Mathew Price came on for the ninth and allowed one run on two hits, ending Price's string of 10 consecutive scoreless appearances. The game got off to an inauspicious beginning when leadoff batter Henry Ramos was ejected for arguing a called strike three. 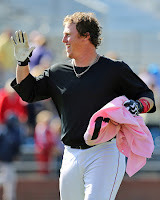 However, he was replaced by Tim Roberson, who hit a two-run homer in the fifth. Stefan Welch had a big night, hitting a two-run blast in the ninth as part of a 2 for 4 night, driving in three runs in total. Keury De La Cruz scored a pair of runs while going 1 for 3 with a walk. Greenville took the only loss of the night, falling 7-3 to the Lexington Legends (KC). Cody Kukuk struggled in his start, allowing three runs on three hits in four innings, while walking three and striking out four. Kukuk fell to 4-9 on the season. Reed Gragnani drove in all three runs, while going 2 for 4 with a walk. It was Gragnani's first multi-hit game in eight appearances since his promotion to the Drive. The game between Lowell and the Williamsport Crosscutters (PHI) was canceled due to rain and will not be made up, as the two teams do not meet again this season. Three GCL Red Sox pitchers combined for a one-hitter in a 2-0 victory over the GCL Orioles. Dioscar Romero got the start and was dominant for the Sox. Romero had been off to a tough start in 2013 after a promising 2012 in the Dominican Summer League, but he showed no signs of struggle on Monday. The big right-hander allowed just one hit in five shutout innings, striking out three without walking a batter. In the process, he lowered his ERA from 6.30 to 4.20. German Taveras threw 3 2/3 hitless innings, striking out three, and Rob Smorol struck out the lone batter he faced to preserve the shutout. The excellent pitching made the victory possible despite the offense only getting five hits. Deiner Lopez keyed both of the run-scoring rallies. He tripled and came in to score on a Jordon Austin base hit in the third, giving the Red Sox a 1-0 advantage. The following inning, Alixon Suarez doubled and advanced to third on a Lopez base hit, putting him in position to race home on a wild pitch. The win moves the Red Sox a game ahead of the Orioles for first place in the South Division. The DSL Red Sox opened their second half with some unfinished business from the first half. In the completion of the game suspended in the third inning on July 4, the Red Sox needed 11 innings to complete the 7-6 victory over the DSL Rays. In a wild back-and-forth contest, the Red Sox entered the ninth trailing 5-2. After two walks and an error, the tying run was on first base with nobody out. Rays pitching was then able to get a strikeout and induce a pop up, holding the bases loaded. A Franklin Guzman single scored Javier Guerra and Oscar Bartomolde, and moved Luis Alejandro Basabe to second., A wild pitch moved runners up to second and third, where both were able to come around on a Darwin Pena double, giving the DSL Sox a 6-5 lead. The Red Sox were unable to hold the lead, sending the contest to extra innings, After a scoreless 10th, Guzman led off the 11th with a double, and came in to score on a Pena base hit. Pena led the offense, driving in three runs as part of a 3 for 6 showing. Basabe also added three hits, including a triple. Victor Ramirez earned the win and is now 2-1 on the year. After giving up the tying run in the ninth, he pitched two scoreless innings in extras, striking out a pair. Daniel Gonzalez was impressive on the mound, giving up just two hits in five shutout innings, while striking out four without walking a batter. The regularly-scheduled contest was a much easier affair, with the Red Sox getting off to a 6-0 lead, holding on for a 6-3 win over the Rays. Dedgar Jimenez has been superb in his first professional season, and the left-hander was solid once again on Monday. Jimenez gave up just two hits in four shutout innings, striking out six while walking only one and lowering his ERA to 1.62 in nine starts. Samir El-Halaby earned the win in relief, giving up three unearned runs in three innings. It was a balanced attack at the plate from the Sox, with eight of the nine starters reaching base. Isaias Lucena led the charge, going 2 for 3 with a triple, a walk, and a pair of runs scored. Pablo Urena and Juan Hernandez had two hits each. Player of the Day: On a day with a number of qualified candidates, the nod goes to Matt Spring, whose two home runs led Portland to a doubleheader sweep. It was the second multi-homer game of the season for Spring, who is having the best offensive season of his 10-year career. Long known as a standout on defense and working with pitchers, Spring has a .512 slugging percentage in 2013 and was named an Eastern League All-Star.